Bwahahaha…actually I just found a funny ad on my food blog. I blogged a series of Ubah gaya hidup recipes to save money. One of them is the Kentucky Fried Chicken using clone KFC flour. And it is so, so funny that the original Colonel Sanders chose to advertise on my food blog this week. Doh…. Take a look now before they pull off the ads. Anyway…I think all my sons naturally know how to cook because it has been ingrained in them. For example, when my eldest son was only about 5-6 years old, he already had an idea what are involved in cooking process. I allowed him to peel garlic skin, cut vegetables with butter knife and other safe kitchen chores. Now, my youngest boy has also been roped into cooking. He loves fried chicken. So, I will ask him which kind of fried chicken he wants. The choices are KFC type, belacan fried chicken, mamak tumeric fried chicken or salty type. I showed him what sauces I rubbed the chicken pieces with and why I must season them for a few hours before I can cook. 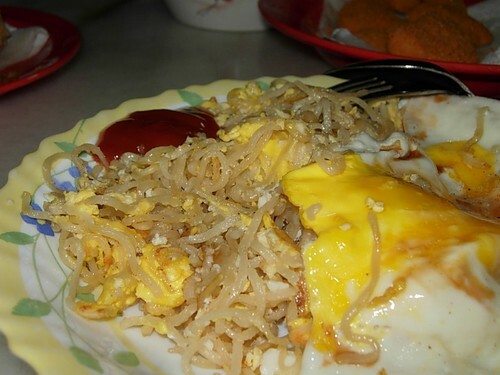 My two older sons now can fry their own Maggi Goreng. Better tasting than Ali’s. Less MSG too cos we do not put so much seasonings. 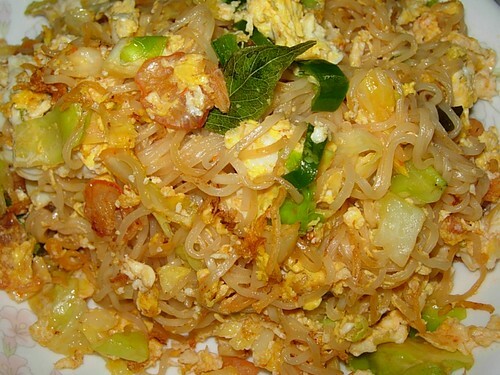 But I prefer my Maggi goreng with curry leaves, some curry powder, lots of cabbage and dried shrimps. Actually, this post is just to highlight that KFC advertise on my food blog eventhough I have so many Kopikat Fried Chicken (KFC). Next Next post: I love too, Antares! That day I saw Pablo’s food blog ads appeared in your blog too. Hahaha. Nvm wut. You DID mention the keyword KFC afterall even if its DIY KFC. Lol! I’m glad I found your blog. I always liked your chicken but I’m afraid it’s not that healthy so I only eat it once in a very, very long time (once a year, or less. Seriously.) I hope you will eliminate trans fat from your frying oil, just like your outlets in the US and the UK. I know trans fat oils save you money because the oil can be re-used over & over again for one week (or more). But if all your Malaysian customers die of heart attack, then you will have no more customers liao. Or is this why you have provided a DIY KFC recipe? Very thoughtful of you, thxvelimarch. Remember your “must have rice” ads a while back? Can we also have a DIY fried rice recipe to help us ubah gaya and also to be healthier? BTW I notice you also hire this 5X mom, like Tun. Wah, this 5X mom, she must be very busy and very good with the interweb. :sad:I cannot see the KFC ads but very mouth watering mee goreng…more ubah gaya hidup recipe pleaase…. sweet jasmines last blog post..An Excellent Award……..